Linda joins the Trustees of Conneaut Lake Park in their efforts to bring back the click-click-click of the Blue Streak’s lift hill with their campaign to get the historic wooden coaster back on track. 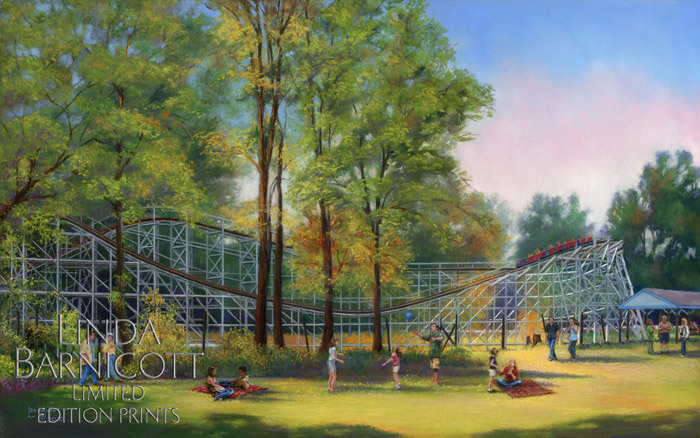 Therefore, 15% of Linda’s profits from the sale of prints of her painting, “Blue Streak Thrills at Conneaut Lake Park”, will be donated to the restoration of the park’s historic Blue Streak coaster. Be part of the campaign by purchasing your limited edition giclée print today!